At this year's ACE Awards Gala, Adolfson & Peterson Construction (AP) received two Associated General Contractors of Colorado (AGC) Awards for Construction Excellence (ACE) honors. During the gala, AP's University of Colorado Boulder Jennie Smoly Caruthers Biotechnology Building E-Wing Addition and Renovation project took home the prestigious ACE Award for Construction Excellence for Best Building Project — General Contractor ($10 to $40 million category). 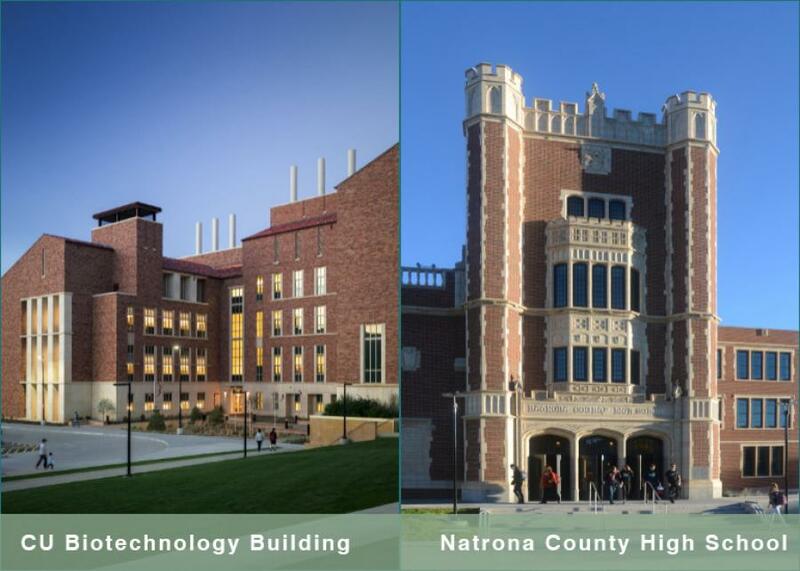 In addition, AP Wyoming's Natrona County High School Historic Renovations Project received an Award of Merit for Construction Excellence for Best Building Project — General Contractor (over $70 million category). "Both of these projects presented challenges that required innovative approaches," said AP's Regional President, Tom Horsting. "We're grateful to AGC for recognition and awarding this innovation." Success of CU Biotechnology Building started in preconstruction with AP providing 18 full estimates and co-locating with the architect to ensure the project stayed on budget. The highly-sensitive labs in the building — which included live animals, billion-dollar investment researches, dangerous chemicals and work by Nobel-prize winning scientists — were required to remain fully operational and running 24-7. The project's overwhelming success of managing the many user groups, overcoming challenges, supporting safety and profitability, going above and beyond for the client and leading to future work sets this project apart from others. Bringing Wyoming's first education center back to life required a vision and a long-term commitment to preserving history and providing space for future generations to thrive. Motivated by the mantra "this place matters," the project team believed in the mission and overcame challenges presented by a complex phased construction plan that kept the 1,800 students on campus. For four years, crews carefully restored historical elements and added new space, blending old with new in a complicated $97.7 million, five-phase project. Faced with incredible construction challenges including removing one-third of the concrete structure while keeping the remaining historic structure intact, and installing new foundations in the historic theater, the project team still completed the project within budget and six months earlier than planned.